1. 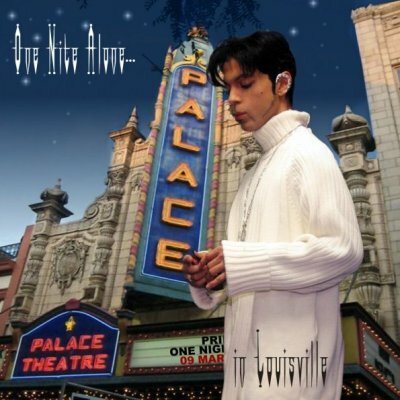 One Nite Alone (instrumental) 2. The Beautiful Ones 3. Venus De Milo 4. Adore 5. Girls And Boys 6. Under The Cherry Moon (instrumental) 7. Nothing Compares 2 U 8. Condition Of The Heart 9. Purple Rain 10. The Rainbow Children 11. Muse 2 The Pharaoh 12. Xenophobia 13. A Case Of U 14. Mellow 15. 1+1+1=3 (including Love Rollercoaster) 16. Strange Relationship 17. Sing A Simple Song 18. La, La, La, Means Eye Love U 19. Didn’t Cha Know? The obvious attraction of this One Nite Alone show is it is the only concert of the entire US / European / Japanese tour that did not have the NPG horn section present – reason enough to raise an eyebrow and take a listen. Because of this both Prince and Renato are the main players (with the help of some sampled wizardry) and it is a fascinating listening experience for anyone who has heard a number of other shows from the tour. The original recording this was sourced from was extremely frustrating and swung from being excellent to being very poor. The recording was almost inaudible in parts and I can only assume this was due to a loose mic connection when it was recorded as the level fluctuated greatly. Added to that there was shockingly-bad sporadic interference which made it very tiresome to listen to. It wasn’t all bad, and the best portion was released by Sabotage on their ‘ONA : The Dallas & Atlanta Aftershows’ release, however they chose to release that part of the show simply because it was free from any problems and the best of the entire recording. Because of this I wasn’t holding out much hope of this release being any good, however I’m pleasantly surprised by the end result. The volume level is (for the most part) consistent with some very minor wavering in places. 4DaFunk have evidently done a fair amount of work in repairing the flaws present on the original recording, and it’s for this reason there are a number of audible corrections during the show. The only tracks which suffer because of this are ‘A Case Of U’, ‘Avalanche’, ‘Family Name’ and ‘Last December’ where the show slightly jumps/skips, but on the whole it does not affect the entire show, and whilst it is a pity, it’s understandable. The recording itself is of a very high quality and whilst lacking the cleanliness of many other recordings, the audience are (mostly) to the background of the recording and the show is loud and clear. Overall the main point of contention with this release are the numerous corrections which had to be made due to the original recording. The show itself certainly lacks the fullness of every other ONA concert simply due to the fact the horns are not in attendance. It’s most obvious on songs such as ‘Rainbow Children’ and ‘Xenophobia’, especially the latter where in places Prince does a scarily impressive job on the guitar in place of the horn section. Extremely unusually the show opens with the piano segment lasting approx. 22 minutes before the show begins proper, however it also contains another piano medley towards the end as was the norm, and is proceeded by a very rare, full length version of ‘Last December’. To sum up, I’d rate this release very highly simply due to the fact it is such a unique show. Yeah, there are numerous edits, and audible corrections throughout, but it doesn’t plague the recording as a whole and they have been done very well. Fans of the ONA tour will no doubt enjoy it for what it is, others maybe less so.